Drawings done in colored pencil. This is a drawing I worked on for the majority of a year. Colored pencil is funny that way…you can take as long as you want, because the layers and layers of color really do pay off in the long run. This drawing has special meaning to me, because I’d had a life-threatening experience with severe pancreatitis and gallstones. Over the course of one winter (2009/2010), I had several surgeries and spent about 14 days in the hospital, some of that time in ICU. To this day, I am very, very grateful to be alive. Recovery time was slow and hard, and included a full liquid diet for a grand total of 8 weeks because I couldn’t manage to keep food down. I did lose 20 pounds in that time, which was nice, but it was no fun not being able to eat food. I had a hard time being creative at that time, as I was always very sleepy and was in a lot of pain. I was tired of my sad little doodles, so I decided to challenge myself with something in color. I’d had my eye on a certain image from “The Phantom of the Opera” and decided it was finally time to take it on. 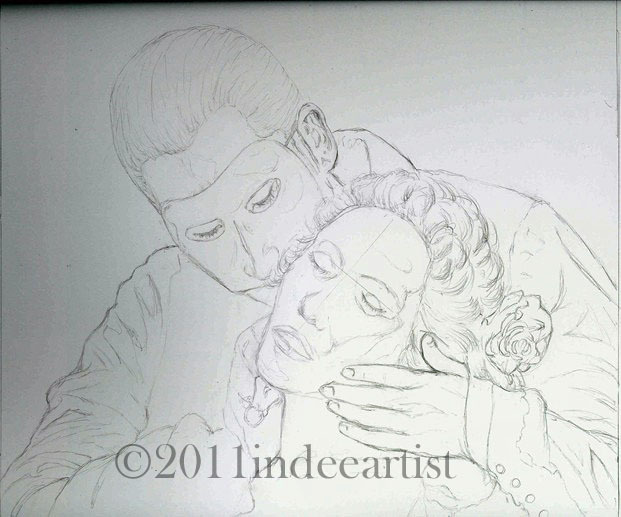 So, sit back and relax to a bit of the Phantom’s music as you view the drawing and its progress images. Enjoy! 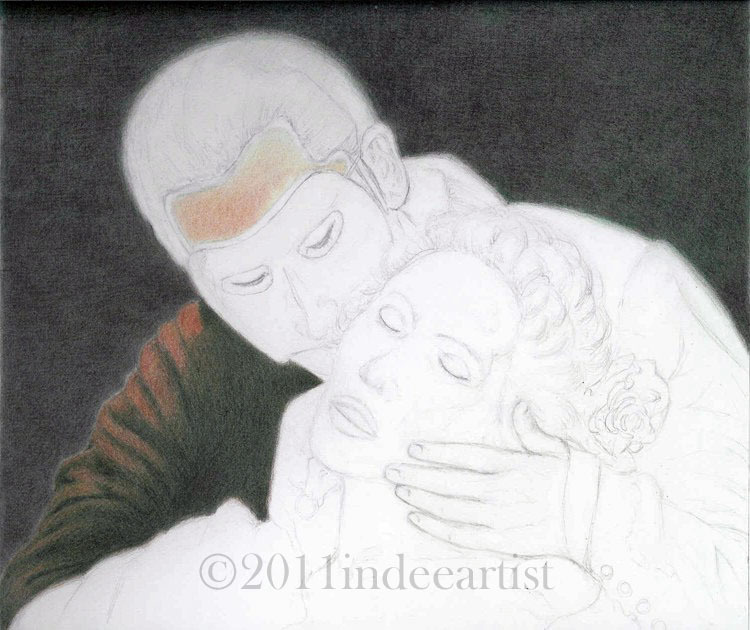 Graphite for the preliminary sketch, and Faber-Castell polychromos colored pencils. I’d say which colors I used, but I used just about the whole box of 120 colors at some point or another for this drawing. In most any given area, there are 15-30 layers of certain colors to get the colors you see in the completed drawing. And now, I’ll post the images. I hope you like it. This one is rather special to me because it was my “healing drawing”. It helped bring me back to my love for art. I’ll also post this image…this one and the one above it are both of the finished drawing…but one is scanned, and the other is a photo. The warmer colors (and shape…it is a square drawing) of the above image are the most accurate, but the details of the image below are also accurate. 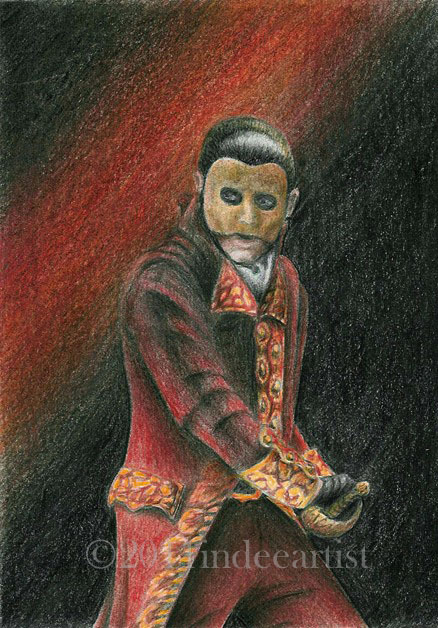 I’ll also post an older colored pencil drawing I did of the Phantom. This one is a 5×7 inch drawing. Hope you like this one, too.